What followed was one of the harshest days of selling in global markets, with our S&P falling 3.59% on that Friday, alone. The weekend did little to curb the selling pressure as market commentators wondered aloud whether this was a “Lehman moment.” Since Lehman’s failure marks the most cataclysmic event in financial markets since the Great Depression, we think it is important to address head-on this fearful reprise and bring a dose of reality to the conjecture, as the differences between Lehman and “Brexit” are far more consequential than any perceived similarities. The invocation of Lehman here strikes us as a case of “recency bias”—a form of post-traumatic stress disorder that the humans who operate markets exhibit in the aftermath of extreme events. The cleanest definition for the recency bias is that it “is the phenomenon of a person most easily remembering something that has happened recently, compared to remembering something that may have occurred a while back.” Ultimately it is easier to recall recent events, especially when a high level of emotion is involved. Ye the more emotion is involved, the harder it is to cleanly recall a sequence of events with a factual level of detail. This is why every time the markets have had a rough patch since the Great Financial Crisis, some investors wonder whether it will be the next acute phase of troubles. A reality that we often cite in these instances is that it is far safer to fly in an airplane shortly after a crash happens, than just before. This is true because those who are stakeholders in the security of flying are on higher alert for any potential problems in the aftermath of disaster. The same is true in financial markets, with one of the clearest signs today being the very safe capital ratios in the financial sector. If you will recall, the troubles at banks were the transmission mechanism through which problems in markets became a real economic calamity, and while we are never immune from problems in markets, they are far less likely to spread and become really deep when in such good shape. The reason we are calling out the market’s recency bias is that a far more apt historical analogy does in fact exists and the set of circumstances around it are very similar to what is happening today. We will visit this example shortly, but it is important to first point out that without question, markets were taken aback and surprised by the vote. Herein lies the one similarity to Lehman—market commentators did not expect the powers-that-be to let Lehman fail. Yet, too much of the rhetoric focuses on the binary question of “whether the markets were wrong about the Brexit vote?” Markets do not think in terms of yes or no. Instead, they handicap likely probabilities, and clearly the expectation was too high that the Remain vote would win. Moreover, we think labeling this a “Lehman moment” relies on the wrong paradigm for understanding Lehman’s failure. On the five year anniversary of Lehman’s collapse, we wrote our commentary suggesting that investors “beware of mistaking a symptom for the cause.” Lehman certainly exacerbated problems, but the key feature of Lehman is that it was caused by really deep, underlying stresses in our financial system. According to the Federal Reserve Bank of New York’s own internal documents, released nearly three years after Lehman’s failure, the Fed essentially says that the bank run began around August 20th, 2008, nearly four full weeks before Lehman filed for bankruptcy. This was the first bank run our country experienced since the Great Depression. Clearly Lehman was not the causal event, it was a symptom. So how does this relate to Brexit? Beyond merely contemplating frightening events, it doesn’t relate in the slightest. As discussed earlier, it is far easier to contemplate horrible possibilities than to weight likely ones. Lehman had some obvious and immediate contagion effects. For example, within days of Lehman’s bankruptcy, one of the largest utilities in the country was on the brink of filing its own bankruptcy due to counterparty risk with Lehman. Meanwhile, days after the Brexit referendum we remain unsure whether the UK will even exit the EU. From here, there will be no next step until at least October when a new Prime Minister is selected in the UK. Only then will we know if a two year (or longer) process for departure will in fact commence. While the uncertainty is challenging for markets to grapple with, the imminent prospects of financial stresses that could bring down companies and impact how the average American lives their life with regard to spending and investment is essentially non-existent. Importantly, despite the plunge in bank stock share prices since the vote, there are no real signs of stress in financing channels. In fact, credit indicators remain mostly constructive and are far more benign than they were a few short months ago. If Not Lehman, Then What? Recall that the recency bias lends more weight to recent events than to something that happened further back in time. There is truly a historically relevant comparison that we have hardly seen mentioned in the press at all following the Brexit vote. Many of you are probably aware that whereas countries like France, Germany and Italy use the euro as their currency, the United Kingdom uses the Pound. This is so despite all countries being members of the EU. As history would have it, the UK was supposed to be part of the euro currency until what is today referred to as “Black Wednesday” (Wednesday, September 16, 1992)— also known as the day George Soros “Broke the Bank of England.” This event similarly happened at a crucial juncture on the pathway to European integration. The effect of the high German interest rates, and high British interest rates, had arguably put Britain into recession as large numbers of businesses failed and the housing market crashed. Some commentators, following Norman Tebbit, took to referring to ERM as an “Eternal Recession Mechanism” after the UK fell into recession during the early 1990s. Whilst many people in the UK recall ‘Black Wednesday’ as a national disaster, some conservatives claim that the forced ejection from the ERM was a “Golden Wednesday” or “White Wednesday”, the day that paved the way for an economic revival, with the Conservatives handing Tony Blair’s New Labour a much stronger economy in 1997 than had existed in 1992 as the new economic policy swiftly devised in the aftermath of Black Wednesday led to re-establishment of economic growth with falling unemployment and inflation (the latter having already begun falling before Black Wednesday). The economic performance after 1992 did little to repair the reputation of the Conservatives. Instead, the government’s image had been damaged to the extent that the electorate were more inclined to believe opposition arguments of the time – that the economic recovery ought to be credited to external factors, as opposed to good government policies. The Conservatives had recently won the 1992 general election, and the Gallup poll for September showed a 2.5% Conservative lead. By the October poll, following Black Wednesday, their share of the intended vote in the poll had plunged from 43% to 29%, while Labour jumped into a lead which they held almost continuously (except for several brief periods such as during the 2000 Fuel Protests) for the next 14 years, during which time they won three consecutive general elections under the leadership of Tony Blair (who became party leader in 1994 following the death of his predecessor John Smith). Note that speculators quickly went on to attack Italy’s currency (then the lira) on the assumption that other similarly frustrated and vulnerable countries would be at risk of similarly troubling attacks in currency markets. This history is rhyming today as traders drive down global markets on speculation that yet again, Italy and other weak countries in the EU might host their own referendums to leave the EU, creating a troubling spiral of events. After Black Wednesday, the UK quickly fell into recession and took years to recover. This too will be the UK’s economic destiny today, and in our estimation, is the most likely consequence—a harsh reality for those in the UK, but not so much for us here in the United States. 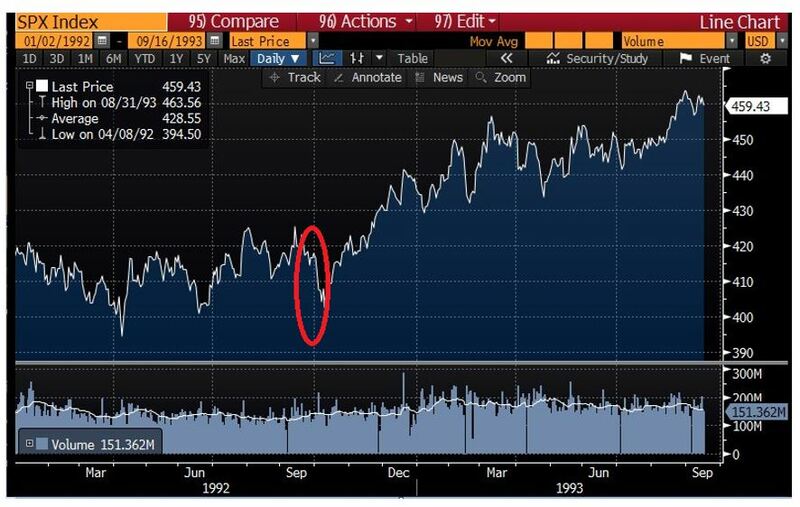 The S&P had been range-bound for months leading up to Black Wednesday. It dropped 4.3% over the next two weeks (once upon a time markets moved a little slower than they do today); recovered to 52-week highs within two months; and, one year later was up 9.4% from that of Black Wednesday. There is no reason to suspect that the S&P move from here on out will be similar. 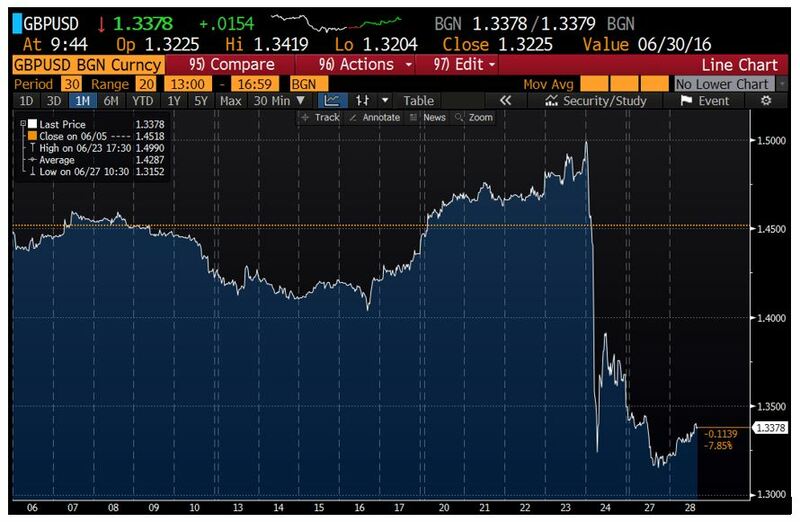 We are merely highlighting the aftermath to show that a traumatic political event out of the UK, with significant economic ramifications need not change the trajectory for the US economy or the US stock market. The biggest consequences today, as they were then, will be local and political, and while there could be some negative ripples that follow-through, we think it is imprudent to position based off of what these ripples might entail. In sum: as of today, it remains unclear when, or even if, the UK will actually leave the EU, it is unlikely that there are any enduring economic consequences for us here in the U.S., and there are no imminent follow-on events that would tell us otherwise. This entry was posted in 2016, Commentary on June 29, 2016 by RGAIA.